Burr Oak Bed & Breakfast Open House: Friday & Saturday from 12pm – 4pm; Saturday horse drawn wagon rides provided – load and unload across from the Fire Hall; wonderful holiday refreshments served. 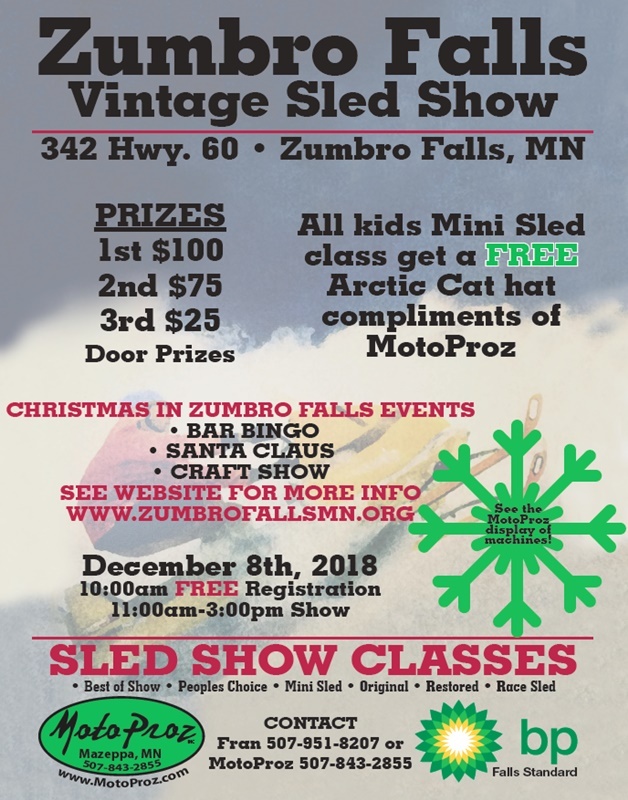 Vintage Sled Show: Saturday – Registration begins at 10am; show 11am – 3pm; cash prizes. Chili Feed: Saturday, 11am – 1:30pm at City Hall. 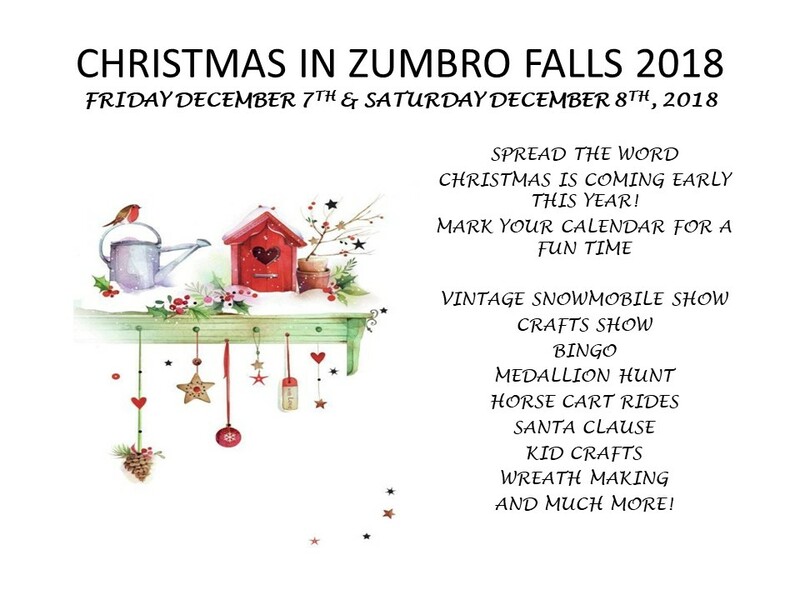 Wreath & Swag Event: Saturday 2pm – 4pm at Zumbro Falls Fire Hall. Santa Claus is Coming to Town: Join us at the VFW on Saturday; the event starts at 4pm and will includes; an opportunity to visit Santa Claus, candy bag, and caricature’s too! Medallion Hunt: Begins on Wednesday, December 5th; $200 cash prize; clues will be posted daily at the City Hall; event sponsored by Neptune Bar & Grill. ZF Christmas Ornaments & Hats For Sale: Get them at Rod’s Service Station or the Craft Sale in the VFW. Lighting Contest: Five best displays of lights within the city limits will each be awarded $100 dollars; sponsored by the City of Zumbro Falls; Turn your lights on and enjoy the holidays. 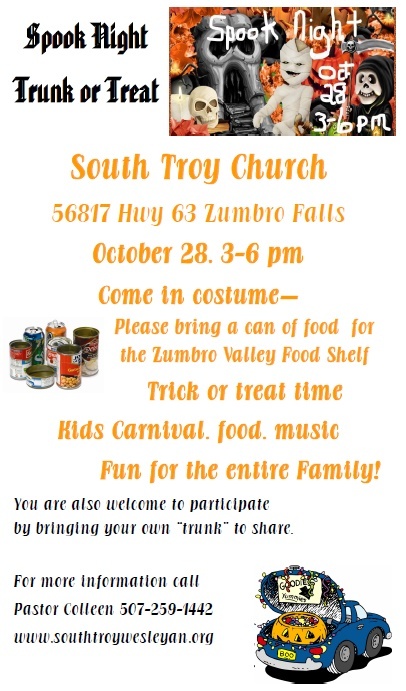 Food Shelf Drive Donations accepted Friday to Sunday for Zumbro Valley Food Shelf located at South Troy Church; each canned item contributed is a submission to a drawing for a prize. SUN: 1pm – 4pm Dedication of the new community gathering place and the Zumbro Valley Food Shelf. 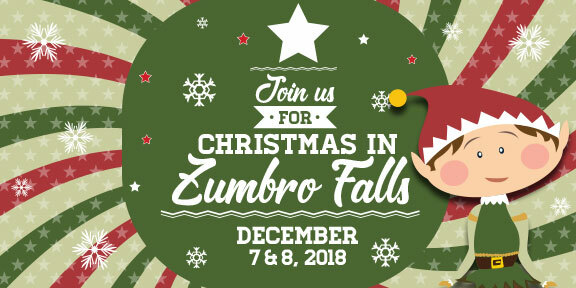 Download the 2018 Christmas in Zumbro Falls flier for more information. South Troy Church is inviting you to the Trunk or Treat on October 28th, 3-6 pm. Fun for the entire family! BACK TO CHURCH SUNDAY! September 16th at 10:30AM. MN TEEN/ADULT CHALLENGE CHOIR will be our guests. Followed by a community cook-out and activities for the kids. 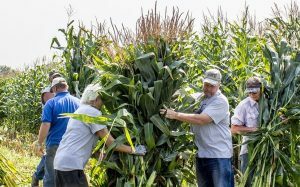 Farm fun for family and friends! Check it out. 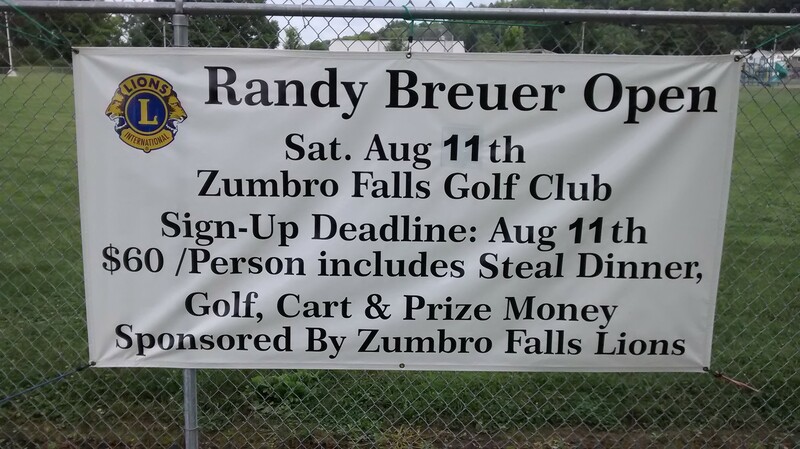 The Zumbro Falls Lions are sponsoring the 2018 Randy Breuer Open at the Zumbro Falls Golf Club. Sign-up deadline is August 11th; Golfers get ready! 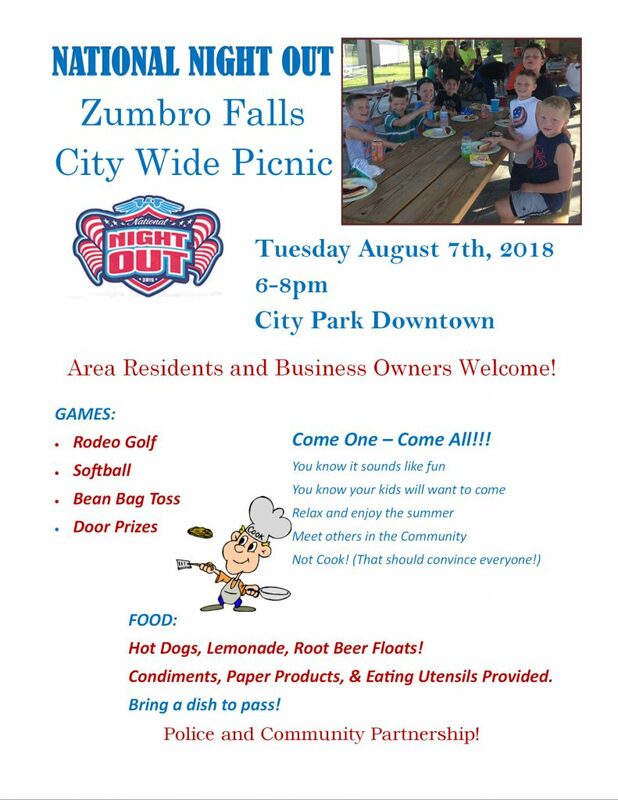 Come join us for the 2018 NATIONAL NIGHT OUT – Zumbro Falls City Wide Picnic. The picnic will take place on Tuesday August 7th, 2018 from 6:00pm – 8:00pm at the City Park Downtown. We hope to see you there! The filing period for persons interested in running for City Government Positions is July 31, 2018 to August 14, 2018 at 5:00 pm. 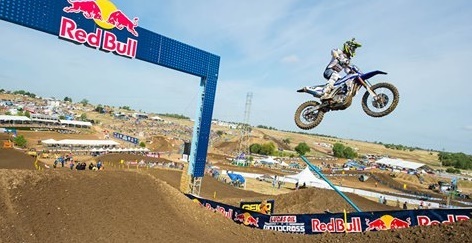 Spring Creek National Motocross will be held July 21st. Visit http://www.promotocross.com/mx/event/spring-creek-2018 for more information. More summer fun!